Once in a while, I'll try to take on some art topics that are more related to the mechanics and principles of design than the theology of art. (Although today, I'll get a wee bit of both in.) Today's topic is point-of-view: where is the viewer in relation to the subject? Why is it even important? We don't often think about point-of-view, unless the artist forces us to. We must first realize that point-of-view is something that has changed over the history of art. It didn't even become a topic that could be discussed concretely until the Renaissance, when perspective was formulated (or reformulated if you prefer, since the Greeks discovered it first, then we forgot about it). 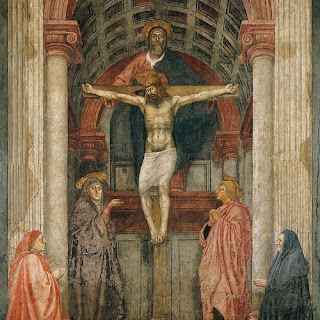 For instance, the viewpoint in Medieval art was limited to only a few options: the viewer was either watching events unfold on a flat stage, or perhaps floating above a scene as a disembodied spectator. Duccio di Buoninsegna's Entry into Jerusalem (left) from The Maestà altarpiece is a good example of the latter. 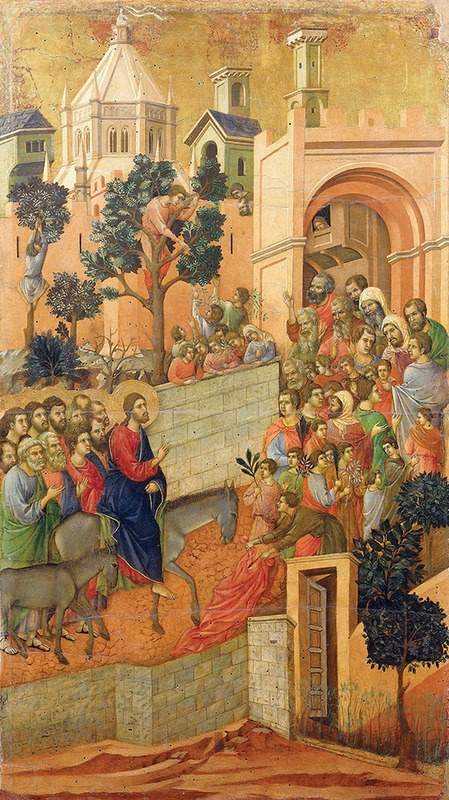 Duccio was anticipating the advances of Italian artists who followed closely after him in that he was beginning to think of objects in three-dimensional space, instead of like stacked playing cards. But since there is no horizon line and no consistent vanishing points, it's difficult to tell exactly where the viewer would be standing in relation to the subject. What Renaissance artists like Brunelleschi and Masaccio finally realized is that in real space, parallel lines appear to recede to a single point on the horizon, called a vanishing point. When the artist placed the subject in believable space, it suddenly gave the viewer a "way into" the work—he could determine his own relationship in space to the subject. For instance, in Massacio's famous Holy Trinity fresco (left), the lines of the barrel vault above the Holy Trinity recede downward to a single point near the viewer's eye level, thus creating the illusion that the viewer is looking up at the Godhead. Why should you care? Because since the advent of perspective, point-of-view is no longer arbitrary; it can carry meaning. 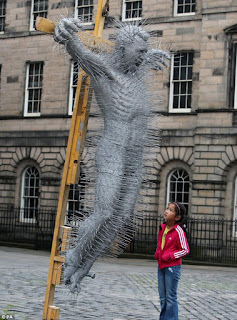 Does the artist make you hover above the scene as a detached observer, or does he place you into the scene? If he places you into it, does your position in relation to the subject have significance? Are you gazing up at the subject, level with it, or looking down at it? All of these questions were immediately explored to their fullest. Frescos on church domes depicted saints and angels as seen from below. Instead of seeing holy martyrs stacked like sardines at eye-level, the viewers could crane their necks and gaze up at their blessed posteriors as they were carried to heaven by angelic children. The invention of the camera forced us again to reconsider point-of-view. You can put a camera anywhere—on an airplane, on a tripod, on the ground. The placement of the camera has an impact on our interpretation of the work. Had it not been for the influence of modern cinema, I probably would have never considered putting the viewer belly-down in the dirt next to the woman caught in adultery (John 8:1-11, right). 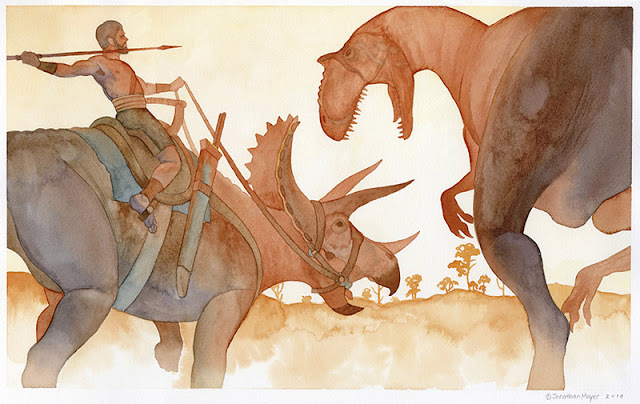 It's unorthodox to be sure, and you probably won't find an illustration like this in any Sunday school materials. We'd much rather see Jesus' face. In fact, we'd rather be standing next to him, looking with pity down on that "sinner." Maybe we think to ourselves, I would have shown her mercy! But what does the point-of-view here say about our relationship with Jesus? Because of our sins, we belong in the dirt with the adulterous woman, clinging to the hem of Jesus' robe. We dare not even lift our eyes to his. And yet, his loving hand reaches down to touch us, to forgive our sins, and to lift us up out of the dust. So the next time you look at a painting, a photograph, or illustration, give at least a few seconds' thought to your point-of-view. 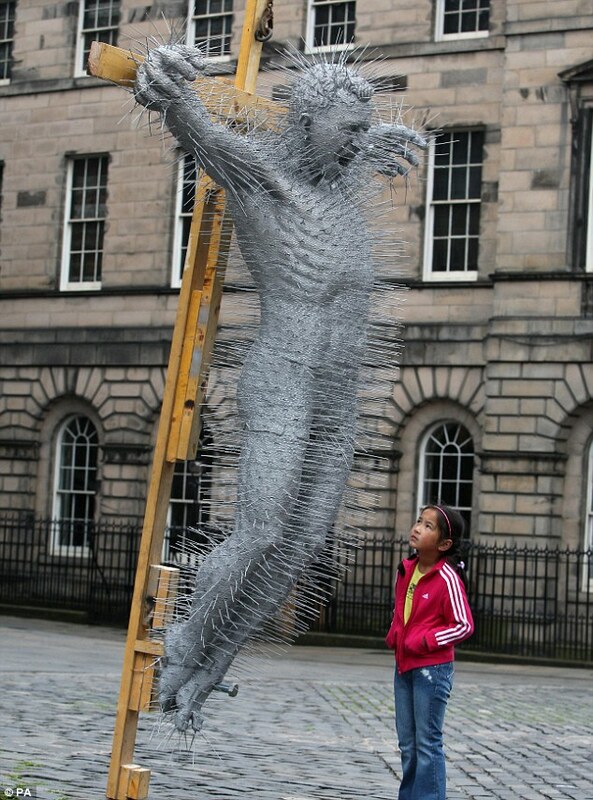 You might see something the artist is wanting you to see. This month has been far busier than usual. Of course there's the usual busyness of the season: family gatherings, travel, shopping for gifts, and still trying to earn a living. As part of a bid for a new employment opportunity, this month I also took the time to design a stained glass window. I spent 24 hours over the course of 2 days to design it. So it's a bit of a rush job, but they were wanting to see how much could be done and in what amount of time. The nativity was the only prompt as far as subject matter, so I wanted to do something that was colorful, exemplified good design, employed a traditional treatment of figures, and yet was completely original (as opposed to lifting figures out of old masters' paintings). I also wanted to lend some meaty Christian symbolism to a scene that tends toward sentimentality and quaintness. The Latin text of the angel's banner should be familiar to most: "Gloria in excelsis Deo et in terra pax hominibus" translates as "Glory to God in the highest, and on earth peace to men." The peace is represented by a dove, which perches in the rafters of the stable. The dove calls to mind the cessation of God's judgment, as it did when the floodwaters receded in the time of Noah. The cross motif is found three times in the scene: first, in the nimbus of the Christ-child, which symbolizes his divine nature (Philippians 2:5-7); second, in the lantern, which represents Christ as the light of the world (John 8:12); and third, in the rough, wooden beams of the stable, which descend directly to Jesus, foreshadowing his death. Some have asked why a Lutheran would also place halos around Joseph and Mary's heads. Lutherans, after all, do not hold to the same view as Roman Catholics concerning sainthood. Joseph and Mary were sinful descendants of Adam and Eve, the same as you and me. Yet, Lutherans also hold to the biblical truth that all believers in Christ are simul iustus et peccator—at the same time saint and sinner. Without exception, human beings are sinful, but are made righteous through faith in Jesus Christ (Romans 3:21-26). On that basis alone, I feel perfectly comfortable signifying the sainthood of any deceased believer with a halo. 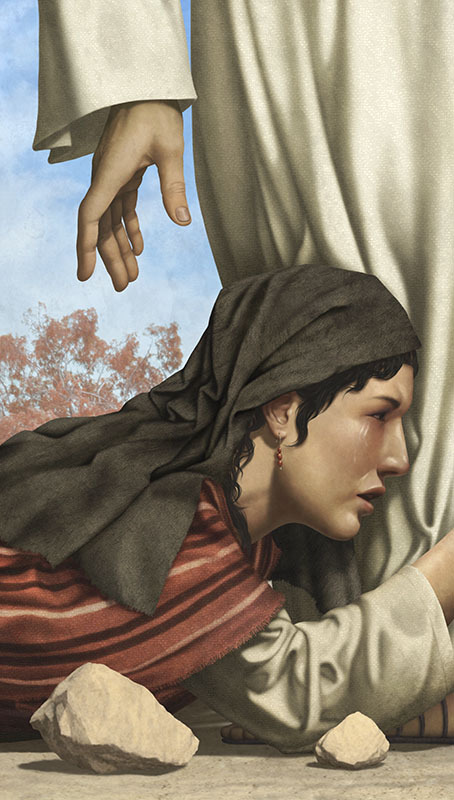 Add to it the fact that Joseph and Mary are described as "a just man" and "highly favored one, the Lord is with you; blessed are you among women!" So in this design, the halos reflect not only a long Christian tradition, but also the righteousness imparted to them by faith in the Son of God. Typically the manger scene is depicted cluttered with animals, especially in popular culture. I opted to include only a lamb. The singular lamb foreshadows Christ's role as the sacrificial Lamb of God who takes away the sin of the world (John 1:29). At the foot of the manger is the fruit by which the devil first tempted Adam and Eve to sin. It is the piece of the story that necessitated Christ's incarnation, his death on the cross, and his resurrection (1 Corinthians 15:21-22). Immediately next to the fruit is the serpent, its head crushed by the sign of Christ's complete humility. Thus the beginning of the story of salvation is placed in context with its conclusion. What if I'm Not Good at Art? 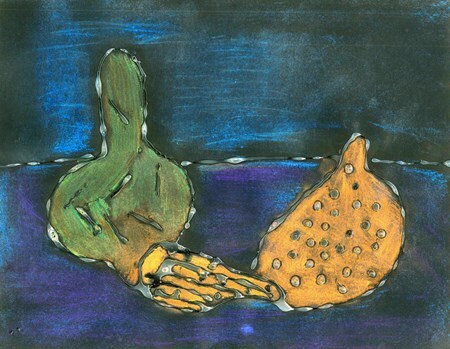 As an art educator, I've often heard the question asked, "Why should I take an art class if I'm not good at art?" The question is raised in at least two different contexts. The first context is when students who are being required to take a gen-ed art class make it known that they'd really rather stick a fork in their eye. The second context is from people of any age who are interested in art, but feel that a lack of talent would prohibit them from learning anything. To those who want to learn art, but don't feel qualified, there's no entrance exam. I've had students of all skill levels, and rest assured I'd rather have a student with little talent who wants to learn than a student with ability who refuses to learn. Students very often surprise themselves (and their instructors!). Especially in the last century, the artistic "elite" have cultivated the myth that artistic and creative skill is in-born, and that an education can do little else but squash our creativity. To put it bluntly, this is a lie. (Talent may be in-born, but skills are learned through instruction, experimentation, and repeated practice.) We all have to start somewhere, and as much as I'd like you to think that I was born with a brush in my hand, the truth is that I've come a very long way since drawing potato-head people with crayons. And most of that distance I did not cover on my own. I'm not saying that anyone can paint like Rembrandt. But I am saying that anyone can learn, and anyone can improve as long as he is willing. So to answer the question as honestly as possible, I would say that in most circumstances, taking an art class or two would be beneficial both to the individual and to society as a whole. For anyone who can maintain an open mind and has even the slightest interest in the arts, I believe it is prudent to invest in some basic, foundational art classes. Now, pragmatic people in either context still want to know what utility there is in studying art. I remember those futile words escaping my lips more than once—"Why do we have to learn this, anyway? It's not like we're ever going to use Calculus." The truth is, beauty can be an end unto itself, so sometimes art defies utility (e.g., the Grand Canyon is beautiful, but it doesn't fulfill a function other than to glorify the Creator). But other kinds of art are functional. They communicate information, evoke emotions, and inspire devotion. A positive side effect of learning more about art is that you'll become more fluent in the visual language that is being employed all around us. We're visual creatures. We aren't all expected to be poets, but we're all expected to read. Communication is built into our humanity that way. I think a little artistic literacy would go a long way toward making the world a more beautiful and meaningful place to live. Last week I was putting my children to bed (which I sometimes do when my wife needs a break). Bedtime seems to be the time when my three-year-old has his most "theologically aware" moments. I think it must have been the last lines of our bedtime prayer, "If I should die before I wake, I pray the Lord my soul to take. And this I ask for Jesus' sake, Amen," that caused him to start sobbing. "What's the matter, Gabriel?" I asked. "I just don't want to die." "Oh, you don't have to be afraid of dying. Remember what will happen when we die?" "Yes. We'll be in heaven with Jesus forever and ever." "But I just don't want to go to heaven, I want to stay here," he mumbled. "There won't be any food in heaven." For the life of me, I don't know what gave him that idea, or why it would even occur to a three-year-old to think about his physical provisions in heaven. But I did my best to assure him that Jesus said heaven would be like a wedding feast (something he has certainly had experience with), and so I think there will of course be food. Besides, I continued, the Bible talks about the Tree of Life bearing twelve kinds of fruit. "Will there be beds?" he asked. "I don't know, but I suppose there might be," I offered. "Jesus said he was going into heaven to prepare a home for us. And he said there would be many mansions with many rooms." That seemed to put him more at ease. We talked about streets of gold and the River of Life, and every heavenly picture I could think of. He asked if there would be cars, and whether or not people could fly. (I said that I didn't know about the flying, but allowed for the possibility. What do I know?) But I eventually brought him back to the most important part of heaven—living in the presence of Jesus for eternity. "When you get there, Jesus will wrap you in his arms and say, 'Welcome home, Gabriel. I've been waiting for you since before the world began.'" He tends to get giddy at that part. I usually have to blink back a tear or two as the thought of that long-awaited moment washes over me. But I'm always conflicted about these conversations. Because I know that Jesus gave us these wonderful pictures in scripture—not because they accurately describe heaven, but because the reality of heaven is so far beyond our experience—even our wildest imagination—that we could never grasp it if he told us. If we saw it, our language would have no way to express it. St. John seems to struggle when he describes twelve gates, each made of one giant pearl, and streets that are both golden and transparent, like glass (Rev. 21:21). Jesus gives us just enough to keep us hopeful, to make us yearn for a place where no tears are shed, where there is no nighttime or death or sickness or hunger. "Your sun shall no longer go down, Nor shall your moon withdraw itself; For the Lord will be your everlasting light, And the days of your mourning shall be ended" (Is. 60:20). So I pass these on to my children. Because even if they aren't true in a literal sense, we have to learn to yearn for heaven. I remember a time in my youth when I didn't want to go to heaven. I thought it would be eternally boring: harps and clouds and people walking around in white robes. Who would want that? But I expect that the older I get, the less I will rely on those short glimpses or pictures, and the more I will come to understand that heaven is so far beyond the limits of my imagination that I couldn't possibly be disappointed. 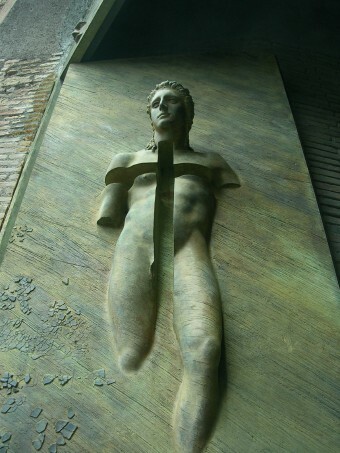 Most of all, I hope that I won't care at all what heaven is like—as long as I get to meet the Crucified One. Oh, how I long for that day! "And after my skin is destroyed, this I know, That in my flesh I shall see God, Whom I shall see for myself, And my eyes shall behold, and not another. How my heart yearns within me!" (Job 19:26-27). We were told things like, "A lot of Missouri Synod Lutherans are going to hell," and "Even the conservatives tolerate false doctrine—otherwise they would leave," and my personal favorite, "If you say a meal prayer with Missouri Synod Lutherans, you are yoking yourself to unbelievers." WELS pastors and teachers like to give the impression that the LCMS is just ELCA without the LGBT sympathies. In other words, many of our pastors and teachers make generalizations, but seem to have no real contact with the Missouri Synod to either inform or discredit these opinions. There is no excuse for a blanket dismissal of our brothers in the LCMS as "false teachers." We should know that the devil is hard at work wherever the gospel is preached. That's as true in the Missouri Synod as it is in Wisconsin. When a WELS family approaches a Confessional, Christ-professing, Book-of-Concord-wielding, Catechism-touting LCMS school and expresses reservations about the false doctrine their children are inevitably going to be taught (true story), they reveal their ignorance about the differences between our synods. The WELS does a good job of promoting a unified image (thank you, WELS Connection! ), but fortunately, is not synonymous with the Invisible Church. The "they think they're the only ones in heaven" joke is probably told in every denomination, but I suspect it must have been written originally of the WELS. Because the thing about Missouri Synod Lutherans is that they seem to possess an acute awareness of the divisions within their synod. No one thinks that you can go to any LCMS church and find orthodox doctrine being preached from the pulpit, as seems to be the case for many in the WELS. I don't want to sound like I'm promoting unionism here, but IMHO, part of the solution is that we have to get together more often. 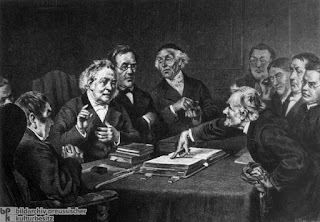 Although ELS, WELS, and LCMS theologians have been having informal discussions at the Emmaus Conferences, I wonder what other opportunities exist for laymen to have similar discussions and, dare I say, "fellowship" opportunities? How about Higher Things? CCLE? Our synodical worship conferences? Or at the very least, listen to Issues, Etc., and join some Confessional Lutheran Facebook groups. Listen to and read the issues that come up, and see how they are dealt with by Lutherans from all three synods. Follow Matt Harrison and the WMLT (Witness, Mercy, Life Together) blog. In short, inform yourself! If doctrinal matters separate two church bodies, so be it. I'm the last person who would suggest that we set doctrinal differences aside, join hands, and sing Kumbaya. But don't let ignorance add to the barrier between Wisconsin and Missouri. Pr. Hans Fiene (of Lutheran Satire fame) remarked on Facebook that interracial marriage might be part of the solution to race relations in America. Might I suggest inter-synodical marriage could play a part in restoring synod relations? 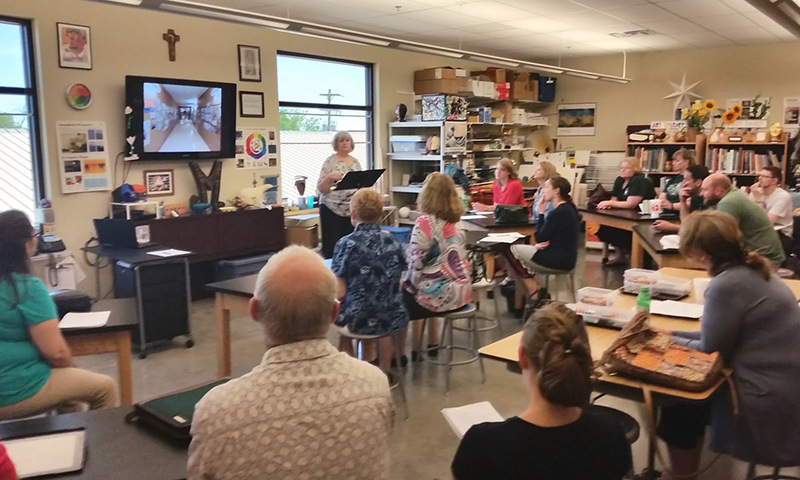 (I only say this in passing, but word has it there's a bevy of beautiful, unattached LCMS women attending Bethany Lutheran College [ELS]. *wink*) No bias on my part, there. I've been to a couple of WELS Worship Conferences, and one School of Worship Enrichment. One theme that has consistently bothered me has been the (over)emphasis of texts, to the possible exclusion of music. Now, they don't say it like that, nor will they probably admit that this is happening, but in the context of our synod as a whole, I've seen even the conservatives quickly change the subject when the issue of musical style is raised. The oft-repeated WELS worship principle is this: The texts must dominate, the music is subordinate, and we should set standards of excellence. In principle, I have nothing against this. But it only addresses half of the issue. When we refuse to address matters of style, it leaves a hole in our worship principles large enough to drive a tour bus through. We typically call this hole "Christian freedom," but I'm not convinced that's the case. In little more than a decade, Koiné has become a household name in the WELS, and their music is a good case study in regard to the WELS worship principles. One of my favorite hymns is Jesu meine Freude, and it is also one of my favorite Koiné arrangements. It takes the text, tune, and even the traditional harmonies of the Johann Franck hymn and gives them an upbeat tempo and contemporary instrumentation. The result is a fresh look at a centuries-old Lutheran hymn. The reason Koiné is an ideal case study here is because they allow us to isolate a single, key variable—style. The text, melody, and harmonies are undeniably excellent and therefore fit the WELS worship principles. But there is a palpable difference between the Koiné recording and a Bach setting of the hymn, and it's a difference of style. The common wisdom WELS offers in regard to style is, "If it offends someone, don't do it." In my opinion, this is too simplistic to be of any use, and easily ignored or misapplied. For instance, it seems to imply that congregational (or worse, individual) tastes should set our worship standards. So the question needs to be asked: In worship, can we make judgments on matters of style without restricting our sacred Christian freedom? I think we can, and we must. Credit for this revelation goes to Dr. Gene. E. Veith, who gave a series of lectures at CCLE XV that I was privileged to attend a few weeks ago. His lectures centered on the matter of aesthetics, and after having read State of the Arts: From Bezalel to Mappelthorpe and heard his lectures, I would guess that there are probably few Lutherans alive who have as much insight into aesthetics as Dr. Veith. One of the major premises of his lecture was that in a great work of art, content and form relate to, and compliment, one another. 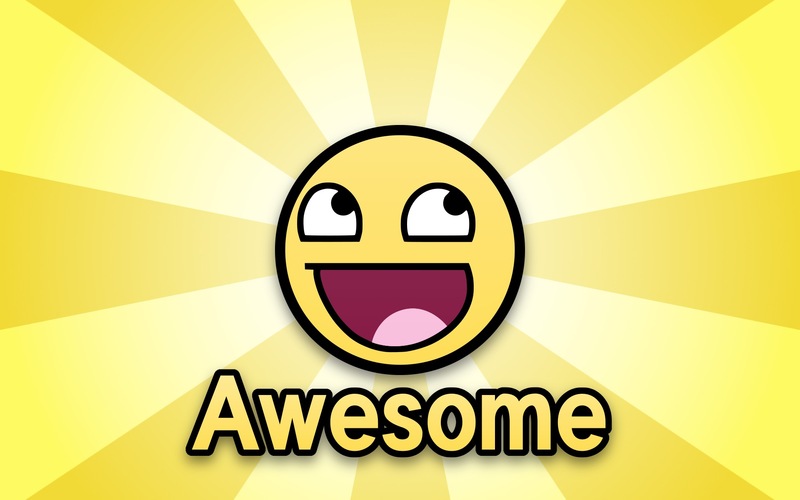 He used a negative example of a beaming smiley-face emoji with the word "Awesome" written underneath it. The cartoon smiley is so antithetical to the actual meaning of the word (i.e., inspiring great admiration, apprehension, or fear) as to be ridiculous. Another example Veith cited was "praise" music. How often do they talk about how "awesome" and "holy" God is, but with banal, repetitive, trite music? The form doesn't reflect the content, so the work of art is a failure. Contrast with "Holy, holy, holy! Lord God Almighty" by Reginald Heber and its tune by John Dykes, which builds a sense of awe as the notes "ascend" to God. The aesthetic form of a work has as much to do with its success or failure as does the message or content. Note: Just to clarify, I am not fully equating style with aesthetics, even if I seem to use them interchangeably. Style is one part of the whole aesthetic experience. Sometimes there is an almost total overlap, and sometimes the stylistic impact is minimal. For instance, a contemporary praise song's melodic and harmonic patterns are determined in large part by the style of the genre. 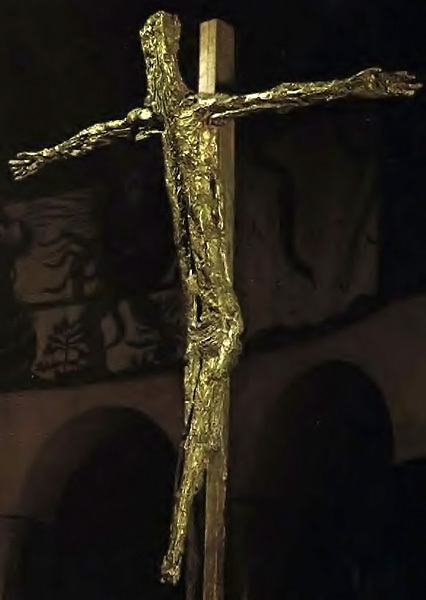 Whereas, in the Koiné arrangement of Jesus, Priceless Treasure, the new stylistic contribution is relatively small and related mostly to instrumentation; whereas its meaning, poetry, melody, and harmonies were still retained in spite of the stylistic facelift. The point is that it isn't totally honest to separate the text (content) from the music itself (form) and evaluate each separately. The style and performance of music is where much of the art exists. It can make the difference between a holy and reverent hymn, and an ironic one. Let's pull this discussion into the realm of the visual arts to look at it from a different angle. 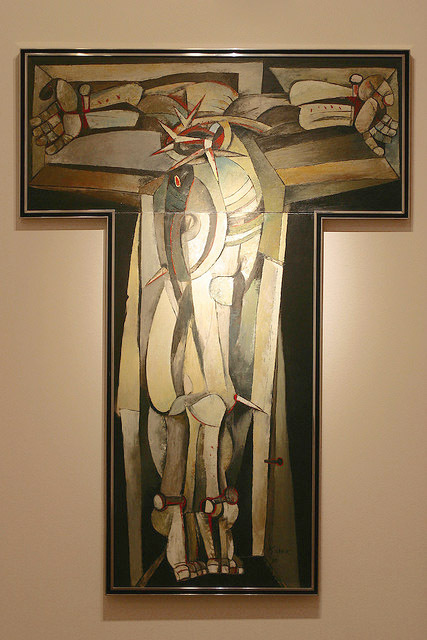 An artist could render a crucifixion using a fractured cubist style that relates in no way to the content. Few Christians of any stripe would be convinced to hang it above their altar simply because the subject matter (content) is ostensibly Christian. And if they did consider hanging it, it would probably be because they personally like the style (form) and think it will make a statement about how non-traditional their church is. But a bad work of art isn't redeemed by good intentions or even a good message. The success of a work of art rests on the harmonious interaction of content and form. 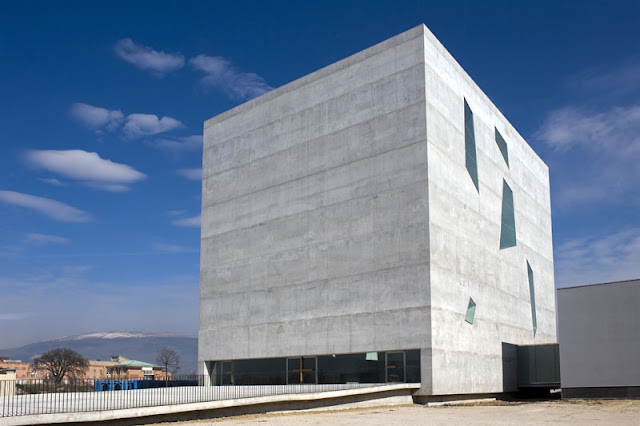 We regularly make major qualitative judgments based on aesthetics. As we should. Why then, does our synod refuse to enter into discussions of aesthetics and style when it comes to worship? 2014 Ntl. Youth Rally, courtesy WELS Facebook page. The short answer, I suspect, is that we are oversensitive towards legalism. I readily grant that this is a legitimate concern, given that WELS still struggles to overcome its pietist roots, and because progressives use the label as a weapon against their conservative brothers. But if we're too afraid of the right ditch, we've over-corrected and landed in the left. We've watched our National Youth Rallies become increasingly like rock concerts, so we can only suppose that the synod must be endorsing it. Even the WELS Worship Conference last summer, which was mostly wonderful and awe-inspiring, featured a scene straight from "Sister Act." The result was that raucous and offensive worship was offered up beside excellent and reverent worship as acceptable alternatives for WELS congregations. On some level, we've convinced ourselves that this is okay. If the texts are good (which isn't always the case), and if there is some liturgical structure, and as long as everything is of excellent quality, it still fits those guidelines, right? The style can be tossed in with Christian freedom. The biggest pitfall before us is that this cafeteria approach to worship ("As long as the texts are good, choose whichever style you feel comfortable with") will inevitably lead to a cafeteria approach to doctrine. You don't have to take my word for it; ask our brothers in the LC-MS trenches. They've been fighting this battle longer than we have. To be fair, WELS hasn't been completely silent on the topic of style. Jonathan Hein's plenary address at the 2014 WELS Worship Conference, Compelling Worship, at least addressed that music can have "stylistic baggage." But I think he worded his argument poorly when he said that we have the Christian freedom to "set the Nunc Dimittis to 'gangsta' rap or the Kyrie to heavy metal," only that it's unwise to do so (p. 17). But if it is unwise (read: unloving), do we really have freedom to do it? St. Paul says, "For you were called to freedom, brothers. Only do not use your freedom as an opportunity for the flesh, but through love serve one another" (Gal. 5:13). Hopefully I'm incorrectly characterizing the synod leadership's views. This is one of the many cases where I would be happy to be proved wrong. There is absolutely a place for Christian freedom in worship. But an uncritical stance toward musical style has allowed a steady migration of unworthy music into our worship. Excellence is a worthy enough goal, but it makes no explicit comment on style. What aspects must be excellent? Do they mean only excellence of craftsmanship, or of performance value, or of artistic merit? Who defines excellence? Judged by its own standards, surely a rock song can be excellent. So can an abstract painting or a minimalist sculpture. It's good to say that we want to achieve excellence in all things, but then we have to follow through. We have to be willing to define our terms, and then make judgments accordingly; "This is good and excellent; this needs improvement; this is deplorable." In the case of Koiné, I preface my analysis by saying that I like their music. More than a matter of taste, it's excellent, because a talented group of Lutherans taking good Lutheran hymns and giving them a modern arrangement could result in nothing less. Even their original music is quite good. But I have to qualify that by saying that these are excellent for a certain purpose, and that purpose is not the divine service. I would like to believe that there's nothing inherently inappropriate about guitars and amps in worship. 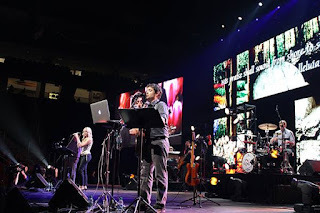 However, they've consistently pushed the limits of what is fitting for corporate worship, until their worship events look and sound no different from their concerts, and that should cause concern. 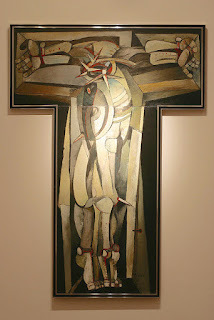 The cubist crucifixion may be a perfectly valid art form and a deeply felt expression of someone's faith, but the aesthetic distorts the content and subverts the order and beauty of the liturgy—and worse, clouds the clear proclamation of the gospel. It thus may be fine in a public arts venue or in your home, but the things we use for worship in God's house are different, holy, and set apart. As difficult and sometimes painful as discussions of aesthetics and style can be, I think it's good medicine. We need a more nuanced and responsible approach to worship than, "Just worry about the texts," or "If it offends someone, don't do it." We need an approach that addresses Christian freedom, but is also true to the historical Christian faith and the rule of love. The Book of Concord describes such an approach, and I encourage everyone to become familiar with it. 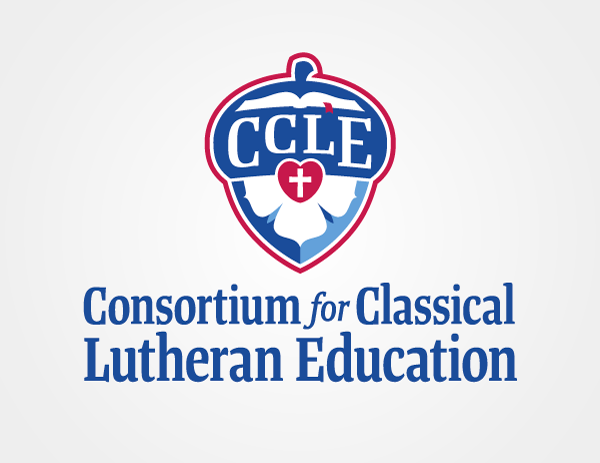 I recently completed a logo design for the Consortium for Classical Lutheran Education (ccle.org), and was pleased to be able to help them unveil and explain the new design at the CCLE XV conference in Keller, Texas. What follows is the explanation I provided with the completed logo. The Shield: The lower half of the logo incorporates a shield. The shield is a defensive device used in battle since ancient times. Since medieval times, the shield has been a method for displaying a soldier’s identifying mark (called a coat of arms) in battle. The shield reminds us that we are the Church militant, and that while we are yet on earth we are not at peace. The devil, the world, and our flesh make war on us day and night, and therefore we are instructed to “take up the shield of faith” (Eph. 6:16). 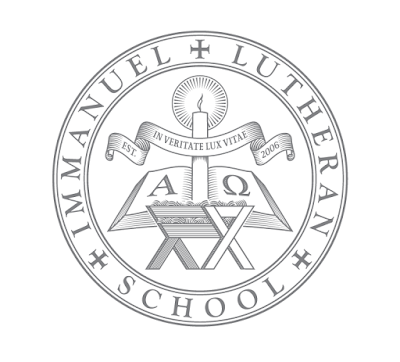 The Luther Seal: Emblazoned on the shield is the rose used by Luther to represent the evangelical church. At its center is a heart containing a cross, to show that we are saved alone by faith in Christ crucified. This faith creates peace, joy, and life, which are represented by the white rose. The rose rests on a blue field, foreshadowing our future joy in heaven. The Luther rose is incorporated into many coats of arms, especially in Germany and Austria. 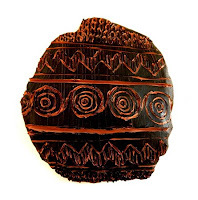 The Acorn: The outer shape of the logo takes the form of an acorn. The oak tree is a specimen known not for its beauty, but for its strength and longevity. 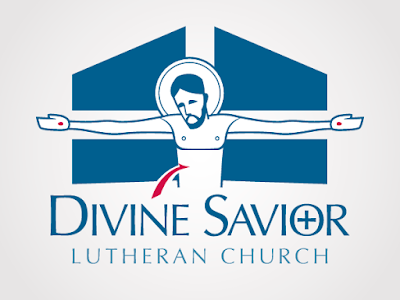 The Lutheran church is 500 years old, and the Christian Church goes back 2,000 years. The classical model of education is centuries older even than that. 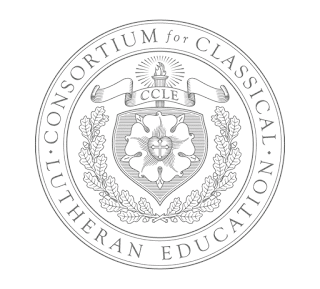 The CCLE is not concerned with the latest educational fads. Rather, the consortium stands on centuries of spiritual wisdom and educational experience. The acorn represents our youths. They are descendants of an age-old oak, endowed with a rich heritage, and entrusted into our care. If they are planted in good soil, and fed and watered with the Word of God so that it yields understanding, we have Christ’s promise that they will grow and yield “thirty, sixty, or one hundred times what was planted” (Mt. 13:23). The Word: At the top of the logo is a depiction of a Bible, which is the Word of God. The Bible is lying open because it is meant to be read and learned. 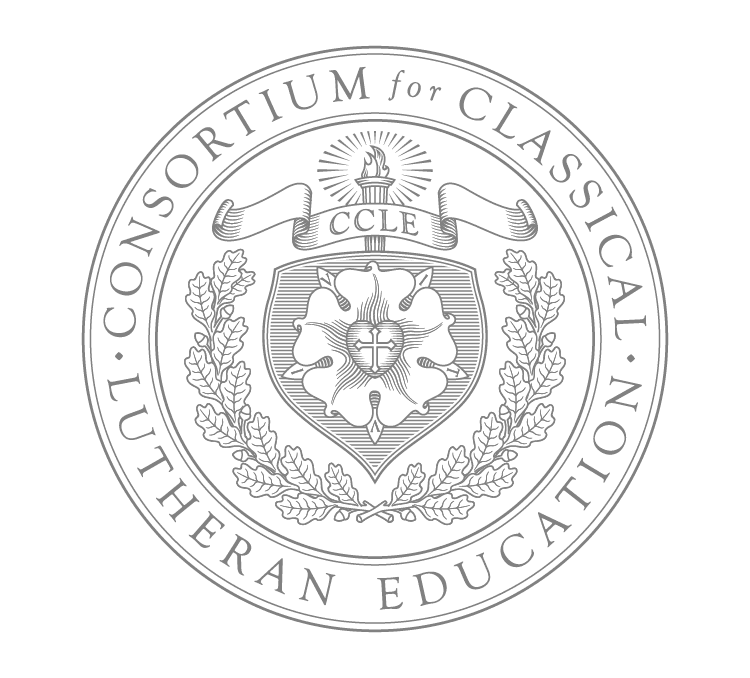 Although much can be said about the value and effectiveness of a classical education, such an education would have no lasting value if the Word of God was not the most important text being studied, and if the cross of Christ was not at the center. As we learn from St. Paul, “All Scripture is given by inspiration of God, and is profitable for doctrine, for reproof, for correction, for instruction in righteousness, that the man of God may be complete, thoroughly equipped for every good work” (2 Tim. 3:16-17). A classical education finds its completion in Christ and his Word. Red stands for the blood of Christ, which surrounds and covers us because of his all-sufficient death on the cross. White represents holiness, truth, and purity, which the Holy Spirit imparts to us through baptism. Blue signifies steadfast faithfulness to the Word of God and to the apostolic Church. The Seal: The seal bears many of the same elements as the logo, but with some differences. Instead of a single acorn, the seal bears a wreath of oak branches, bearing acorns. The shield and Luther’s seal are dominant, and the Latin word “VIVIT” (meaning, “He lives”) is inscribed in the leaves of the rose. 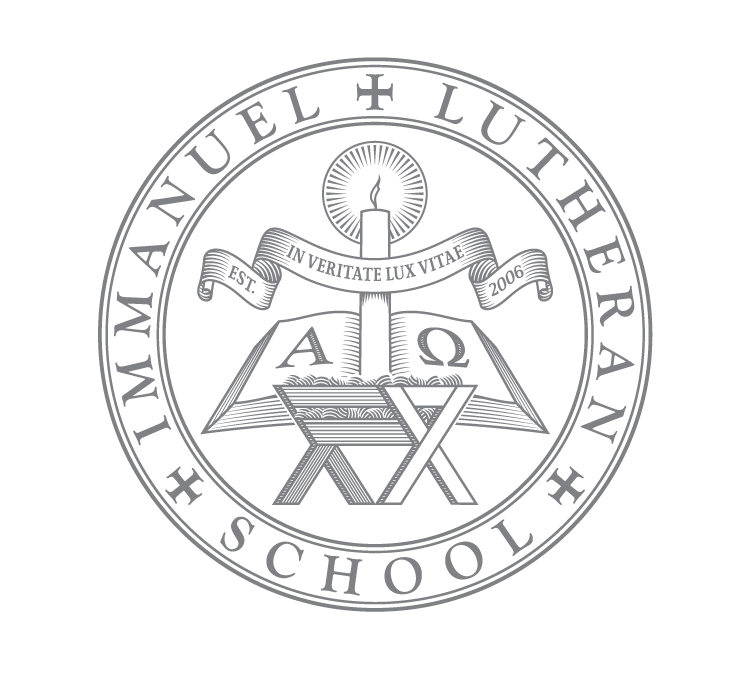 Above the banner that contains the consortium’s initials, a torch proclaims Christ as the light of the world and the source of all truth and knowledge. Invariably, the first thing a prospective client wants to know is what a logo will cost. Regardless of the quality of the product, churches (and businesses) operate on limited budgets. I get that, which is why I try to keep my prices very reasonable. Your average country parish probably doesn't have a large slice of disposable income. On the other hand, neither do I, so I have to balance my client's needs against my own. I don't have a flat fee for logo work. That may frustrate those who want a "bottom line" figure up front, but if you think about it, it makes perfect sense. You wouldn't expect a roofer to charge the same fee to re-shingle your house as he would to re-shingle the local country club. There is a formula to it (although not necessarily a rigid one). I try to gauge the size of my client, how much work the project will take, supply and demand, range of usage, turnaround time, and other factors. Unused logo that incorporated the shape of the church's windows. Oh boy, here it comes. He's going to start throwing around huge numbers, talking himself up, and eventually we'll be convinced that if we don't commission him, we'll be losing money! I can just hear it now, "Only ten low payments of $199.99!" See? I told you. Smoke and mirrors. So just answer the question already. The absolute lowest I currently charge is $500. (That would likely be for a small church with, say, less than 100 parishioners.) I consider that to be a reasonable price for the amount of support I provide, the number of designs you get to choose from, the level of input you get, virtually unlimited changes, and so on. 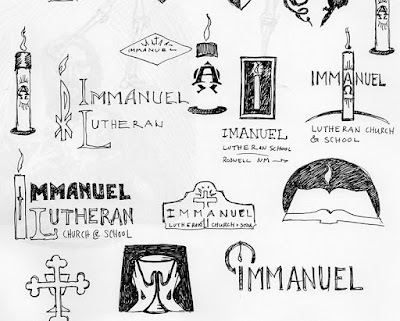 Best of all, if you're a Lutheran church, I already know more about you than just about any designer you'll be able to find. But wait! If you call now... just kidding. 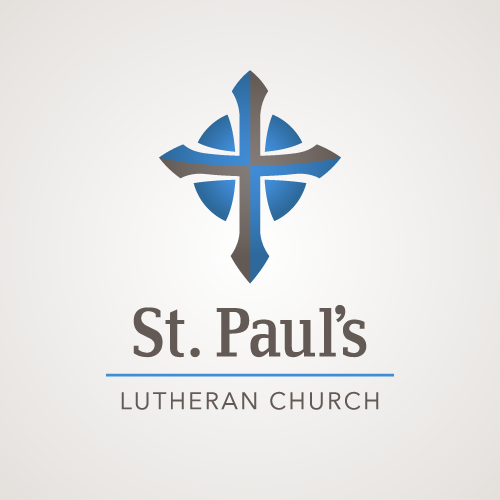 By the way, if you're happening across this page by accident, I don't design only for Lutherans—or only for churches. I'm happy to work for any paying client. I just don't do pro bono work, because I can't eat that. As soon as I get a clear description of what the client wants, I draw up a project agreement detailing what rights will be transferred (more on that later), what the fee will be, timeline and due dates, etc. I sign it and mail it off to be signed and returned by the other party. The first payment is a deposit, usually 10% or $100, nonrefundable, which I require before beginning work. That just ensures that any preliminary work I do is compensated for if the client withdraws from the project. (This hasn't happened yet for graphic design work, but I have put significant hours and mileage into a liturgical project and gotten nothing for it.) But the deposit counts toward the total fee—so it isn't in addition to the fee. The balance is due within 15 days of completing the project. So the total fee, plus any additional expenses (e.g. 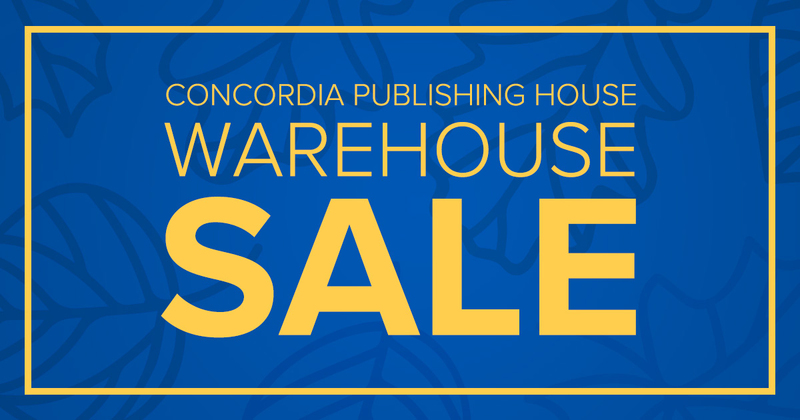 font licenses), plus additional fees (for extra logo treatments, seal design, etc. ), minus the deposit. Based on my current rates, your total "out-the-door" expense is usually less than $800. So whose design is it, anyway? And what can we do with it? As to what you can do with it, you can reproduce it in any medium you desire: print ads, bulletins, banners, video ads, t-shirts, mugs, or macaroni noodles. What you can't do is alter the design. If at any point you want to make changes to the logo, I include a clause in the contract that requires you give me first choice to make changes (for an additional fee). If I decline, you may take it to a different designer. If you want a totally new design, you're of course free to commission any artist at any time. How long does it remain ours? The rights remain yours for as long as you continue to use it—whatever length of time that may be. If you cease using it (for instance, if you design a completely new logo), then the rights return to me. Can we print the logo on tie-dyed shirts and outline it with sequins? Most likely, no. Artists have the right to determine how their work is displayed. I include a brief set of identity guidelines to ensure that your logo is displayed consistently and professionally. This helps to establish your "brand" or visual identity. So unless part of your permanent identity is tie-dye and sequins, and unless the original logo design took that into account, it is very probable that I wouldn't allow your logo to be displayed in such an unflattering way. Okay, but what if we don't like the final design? I can't stress enough that this is incredibly rare and highly unlikely. It's never happened to me. If you don't like it, it obviously isn't "final"—and I will keep working on it. But if for any reason the client and I reach an impasse, there is an industry term known as a "kill fee." The fee varies depending on the level of work already done. The kill fee is usually between 50-100% of the original fee. Because a family's gotta eat. (You usually don't get to keep your money if you don't like the plumber's work.) Upon termination of a project, the kill fee is due, but none of the rights are transferred to the client. The reason this is unlikely is that as much as I need the money, having a good reputation with my clients is equally important—if not more so. I've received most of my business by word of mouth, and having an upset client who just shelled out a bunch of money for a design they don't want is not worth it. So I will go to any lengths to find a design you'll be satisfied with. If you're still not convinced, feel free to read through my previous post that covers the design process from start to finish. There's a lot of push-and-pull from client interaction, and I credit that dynamic for several of my most successful designs. In short, there's a lot of legal mumbo-jumbo. But I make sure that I communicate to the client exactly what they are getting. Good communication is key to a good logo design and a satisfied customer, and so far, I've only had satisfied customers. Did I miss anything? Leave a comment or question and I'll answer it in a follow-up. Until I find a wealthy Lutheran Pope to keep me busy with liturgical art until age 94, I'm happy to say that God provides other means of income. Graphic design—church logos in particular—have become my bread and butter of late. This surprised me, because in college I often thought of graphic design as a "lesser" art form, grouped down there with advertising, typesetting, and commercial stuff with little creative value. But since then I've had to diversify my interests, and I found ways to advance professionally in fine art, illustration, and graphic design. 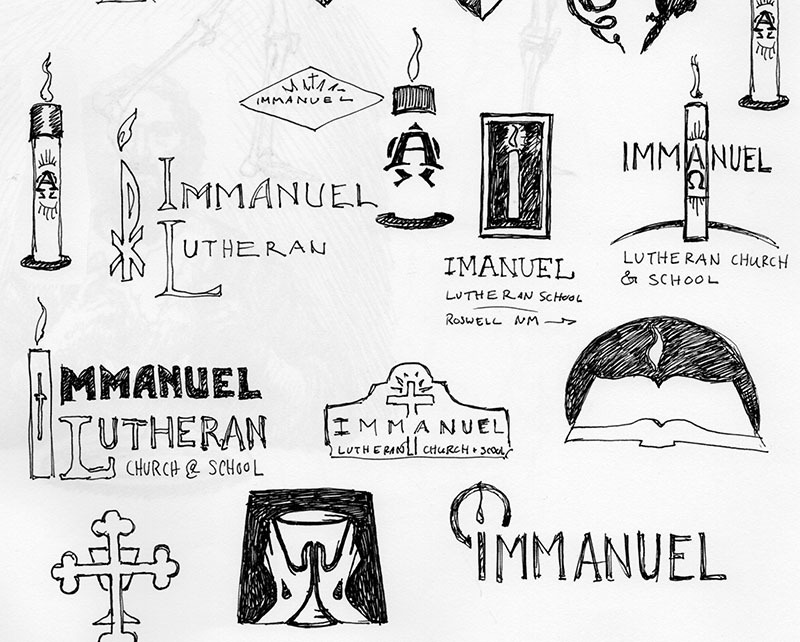 A lot of folks are curious how I go about designing logos. It's a scary step for some people—making a commitment to buy a product that you won't see until it's finished. They want to know how much control they'll have, and if they will like the result. A logo says a lot about you. It can powerfully proclaim what you believe and teach. Or it can say, "I paid my cousin $20 to draw this in Microsoft Paint." And whatever it says, you're stuck with it—at least until you can find someone better to fix it. So hopefully I can remove some of the mystery and anxiety from that process. 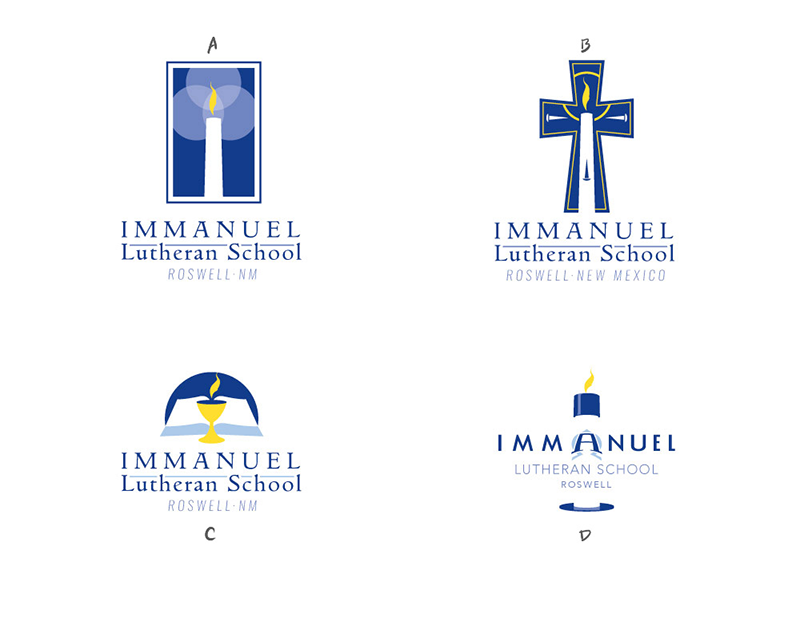 As an example, I'll use my most recently completed commission for Immanuel Lutheran School in Roswell, New Mexico. I had little to go on to begin the design work. Some clients prefer it that way; they don't want to show me what they had before, because it might prejudice me toward a certain idea that they might be tired of. (They want something completely new, not just a rehashing of an old design.) 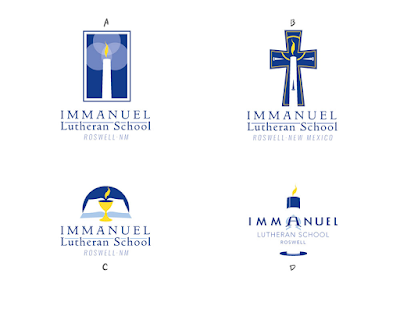 But in this case, the school wanted to retain a nod to the original design, which was a paschal candle. The client gave me a few keywords to focus on: baptism, Christ crucified, classical education, vocation, catechesis; and their motto, "In Veritate Lux Vitae" (In Truth is the Light of Life). Most of these are abstract ideas that are difficult to visualize. But I promised to keep them in mind. If the client feels like I'm not meeting their needs, no amount of artistic polish is probably going to satisfy. Whenever I begin work on a logo, I start on paper, in my sketchbook. It's the fastest way to get ideas out of my head. Sometimes there's nothing there worth keeping, but the point isn't to create "keepers." In idea generation, "bad" ideas are just as useful as good ones. It's more about developing the muscle of your brain to do hurdles. The best idea is never your first idea, so the more ideas you can spill out of your head, the more likely you are to end up with a great one... eventually. The more often you do this, the easier and faster the good ideas come. In all likelihood, the client won't see any of this. Because when I send the first "sketches" to the client, I'd like them to be in the same medium as the final product. They probably can't look at my scribbling and see a shiny vector drawing in their minds' eye. So when I've got at least a dozen or more ideas on paper, then I go to Illustrator and start sketching. I call it sketching, because even though I draw up the designs with clean vectors, they aren't anywhere near being complete. They're still just a half step beyond idea generation. Every medium has its advantages. I can sketch very quickly on paper, but Illustrator lets me duplicate, edit, rotate, and translate shapes. Sometimes, just "playing around" in this way can result in accidental shapes that suggest something I hadn't thought of before. Again, it doesn't always produce anything worthwhile. In this case, there's a lot of junk. But if nothing else, it gives the client inklings of what they do and do not want. I began working in two colors, black and gold. (I thought these were the school's colors, but it turns out the photograph of the embroidered logo above made the navy blue look black. I color corrected it afterwards for your benefit.) 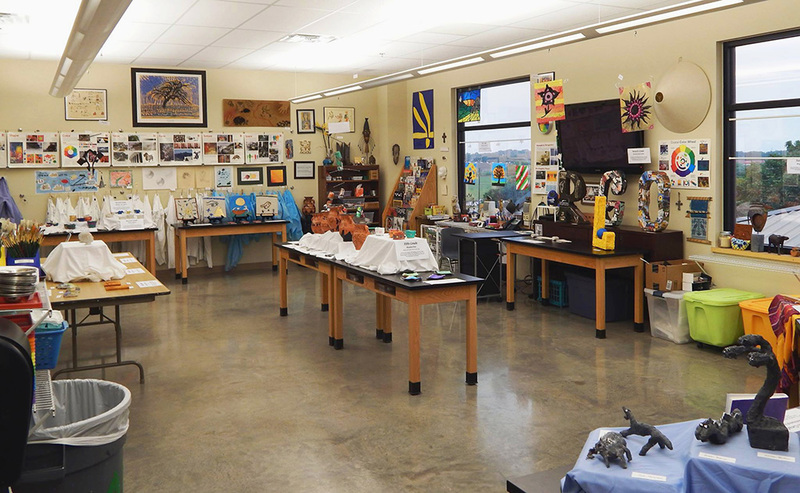 Some of the designs were keyed more toward the New Mexico flag and its cultural heritage. Like I said, even bad ideas are helpful at this stage. The school headmaster communicated to me the leanings of the school board in terms of which designs they liked and which they didn't. So I went back to the drawing board for round 2. The second round of designs included numbers 1, 4, and 9 from the first round (now labeled A, B, and C). The black was corrected to blue, basic type treatments were added for context, and other minor adjustments were made. I also threw in a design I happened upon later (D), hoping it might have some of the qualities they wanted. In round 2 discussion, the board was leaning towards design C. Option C was working the best as a design, but I wasn't sold on it—the similarities to the CPH logo were getting stronger the more I worked on it. So I went back to "play" mode in Illustrator, starting from scratch but trying to keep in mind the things they liked about option C. I mulled over the world "Immanuel," trying to figure out what impressed me most about the name. Immanuel means "God with us." How could I show that? Although it seemed obvious from the beginning, I had initially dismissed the idea of a manger, because what school would want to use a "Christmas" logo all year round? But perhaps abstracted, it wouldn't seem so Christmassy. I drew a manger in flattened perspective, and when I squeezed the sides together so that the legs of the manger overlapped, it resulted in a very nice abstraction and repeated triangle motif. I wanted to get Christ, or a cross, back into the design, too. So I placed a nimbus over the manger, and lo and behold, it also created a chalice and host. The manger also created a nice downard-pointing arrow, which reinforced the God-to-us concept. I immediately loved the idea, and hoped the school board would, too. I created designs E and F to submit along with the other round 2 options they were already considering. F included a stable, or possibly a school, as a containing shape instead of the open Bible. There were some positive reactions to E and F, and some who still liked B and C. Discussion continued for a few weeks, during which time I had to just sit back and let it run its course. If I had kept sketching or brainstorming, or introduced new designs at that point, it would have just set the discussion back. 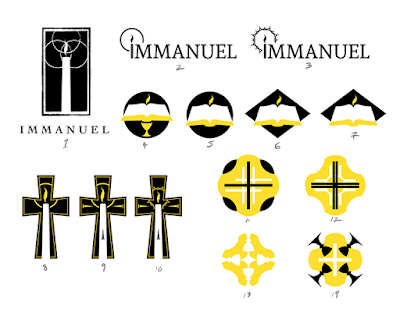 At some point, the headmaster asked if the Paschal candle or flame could be reintroduced to the E and F designs. I initially balked at the idea, knowing that including a candle would mean something else would have to go—most likely the cross/nimbus. But trying to keep and open mind, and not wanting to disappoint, I tried it. I ended up liking the result more than I thought I would. The eucharistic symbolism was lost, but for the purposes of a school, it was more important to keep the motto and "teaching" aspect in mind. The school board finally settled on E2, but said that they preferred the type arrangement from F2. A clean, sans-serif font like Futura would compliment the geometric simplicity of the logo, but it also says "modern!" 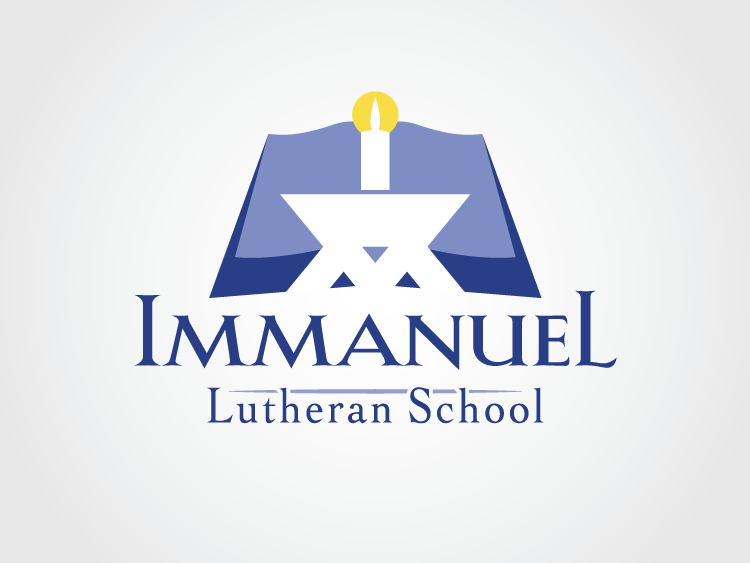 when Lutheran schools typically want to proclaim "tradition!" So I began the search for a serifed font that would still look sufficiently angular to match the aesthetic of the logo. I try to avoid easily recognizable fonts, even if they might have the right characteristics. Futura, Copperplate, Arial, Trajan, etc. are too familiar and can carry bad associations, especially to typography snobs. (I'm slowly becoming one.) Which means that finding the right font means looking outside your own library. In one sense, I hate this part. I hate it because you really have to know what you're looking for. If you don't, you'll spend hours scrolling through fonts until your eyes are bloodshot and your head is pounding from focusing so intently on the screen. My favorite tool is FontSpring.com. I don't even bother with the free font sites, because you have to page through too many Homer Simpson fonts to find the gems—and even then, they're gems in the rough. They might not have full character support, or ligatures, or maybe they don't look as clean at 80pt as they did at 18pt. So I go to the professional font foundries. They have better fonts and better tools for finding fonts (e.g., keywords and dozens of specifically defined categories). Sure, you might have to pay $50 for a font license, but the perfect font is well worth it. 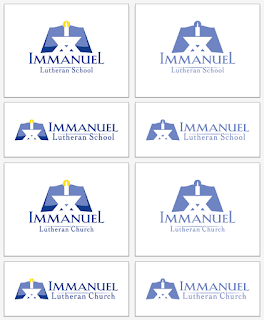 I used the "preview text" tool in FontSpring to enter "Immanuel," then took a screen capture of the result in order to preview it with the logo. No sense paying for a font that you won't use. I sent the board my four top picks—not to see which was their favorite, but mostly in order to see if there were any knee-jerk reactions against a particular font. (Sometimes artists need to be able to use their expertise without a board micro-managing their design choices.) Numbers 3 and 4 were lower- and upper-case versions of the same font. I liked 3 the best. It was unique (which is great for making it stand out from the crowd), still geometric, and had a nice "scriptorium" feel that, at least to me, speaks pretty well to the heritage of the Christian church. Wouldn't you know it, they didn't like 3 or 4. They preferred my least favorite, number 2. (I think that's a law of nature or something.) I disliked 2 because of its similarities to Copperplate. As much as I wanted to "pull rank" and use 3 anyway, I felt that would not be the best decision for my clients. So I went on the hunt for another serifed font that wasn't too quirky, but still had a unique flair. I looked for something that inhabited the happy medium between numbers 1 and 2. I have to say, even though I didn't get my first choice of font, I'm very happy with the result. Most of the time, the dynamic push-and-pull between myself and the client has produced amazing results. It has taught me that despite my experience, I don't know everything, and there is always room for improvement. When I don't agree with a client's decision, it forces me to look for other options that I wouldn't have considered to begin with. Sometimes the road gets a little bumpy, but when we arrive at a solution that makes everyone happy, it's a beautiful thing. Looking now at the final result, it seems that it really couldn't have been any other way. While I was still looking for fonts, I began working on the seal. Since I had the logo design proper completed, I had enough information to proceed with the seal. Even though I had a fairly good idea what the end result would look like, I started on paper again. There are a couple of common styles I've seen used for seal designs. Some are clean, geometric, and modern, while some have a "retro" engraved or woodcut look—and there's everything in between. In the case of institutions that are more than a century old, chances are good that their seal was originally created with a traditional printmaking technique. Many of them have updated to vector-drawn versions of their seal that maintain the traditional design, and in some cases, even the engraved style. This speaks to the age and strength of an institution, and I wanted to replicate that look. Seals are always round (owing to the fact that they were designed for pressing into wax), and often contain symbols of knowledge, heraldic symbols, the date of the school's founding, a Latin motto, scroll motifs, etc. I just needed to modify the logo design into a line-drawing style and include the motto and name of the school. I keep a library of scroll banners (some that I made, and some of which are stock vectors), which I can then modify to fit my needs. Doing it that way can save me hours of work. I won't get too detailed in explaining my process here, but it basically consists of drawing a curve, then duplicating it along a path to create the engraved lines. It takes some adjustment to get the direction and spacing right, but a design like this can be finished in a day or two. The last part of the design process consists of creating all the different variations of a logo that the client might need. 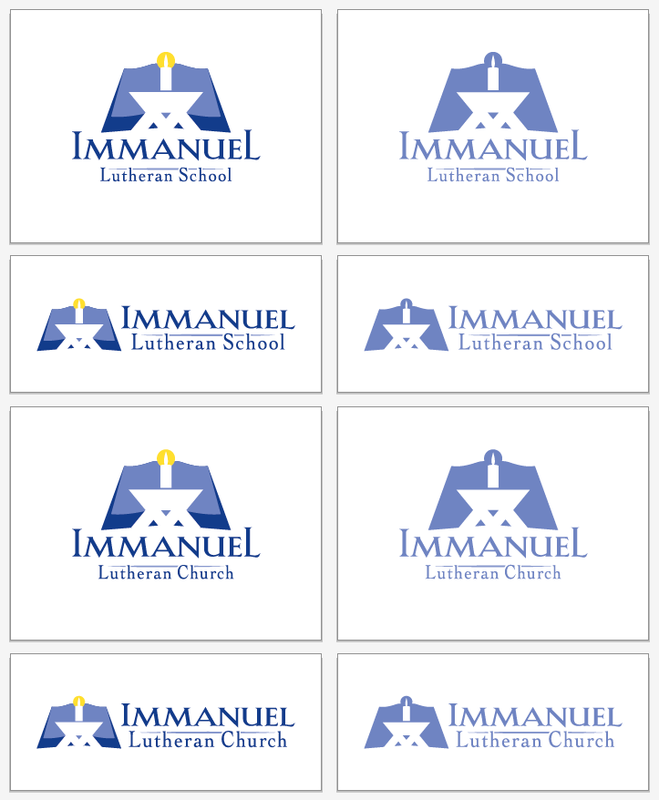 To make a logo versatile, they'll need both horizontal and vertical layouts, and sometimes versions for both a church and school. It's also likely they'll need a one color version of each logo, in case it isn't being printed on white (or due to limitations in cost and medium of reproduction). So for each logo, I end up creating 6-8 versions for the client's needs. The client receives the files zipped up in vector (.eps) format, and if required, raster formats (.jpg or .png) as well. Vector files are infinitely scalable, and can be printed billboard size if desired with no blurriness or loss of quality. The last thing that I do is work up a set of identity guidelines. 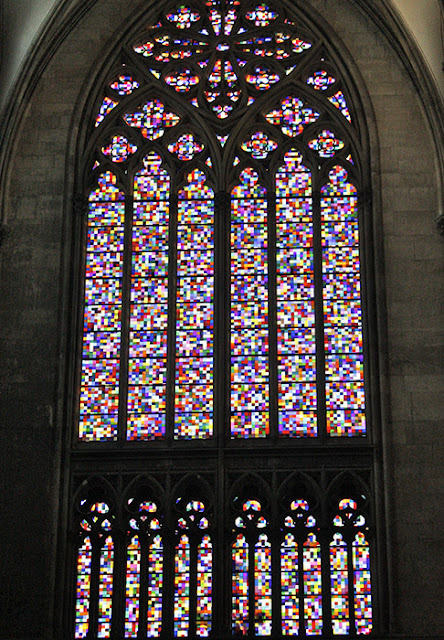 Not everyone is a designer, and churches especially are not known for keeping artists on staff. Things that are second nature to the artistically inclined, like layout and spacing, are sometimes a foreign language to the client. So in order to get the best use out of the new logo, I send a page worth of condensed instructions as to color, usage, layout dos and don'ts, what properties can and cannot be changed, and minor legalities. The client first contacted me with an inquiry on Feb 4 of this year, and by the end of the month I had a signed agreement and a deposit. They requested a finish date of June 1. The logos were delivered on May 12, almost three weeks ahead of the deadline. I have only ever missed a deadline if the client needed more time to reach a decision. This sometimes happens, but I'm willing to give clients as much time as they need on such an important decision. Clients often ask me what a good timeline is, and I tell them that I can work as fast as they are able to give feedback. Usually there is more than one person involved in the decision process, which tends to slow things down. Which is fine—it takes time to build consensus and communicate clearly what everyone's expectations are. My fastest turnaround time was under six weeks from inquiry to finished product. It can make for more stress, but it's certainly possible with a small number of people involved. For most purposes, I would suggest planning for 2-3 months. If you have any questions that I haven't addressed here, I'd be happy to answer them. Otherwise, I plan to follow up on this post with another post that deals specifically with copyright, payment, and legal matters; the "business" stuff.